Robert Clive’s decisive victory at the Battle of Plassey in 1757 firmly established British supremacy in India thereby opening the door for expansion of the Honourable East India Company. After two long and bloody campaigns a Peace Treaty was signed at Sugauli in 1816. During the war a deep feeling of mutual respect and admiration had developed between the British and their adversaries, the British being much impressed by the fighting and other qualities of the Gurkha soldier. Under the terms of the Peace Treaty large numbers of Gurkhas were permitted to volunteer for service in the East India Company’s Army. From these volunteers were formed the first regiments of the Gurkha Brigade, and from this time stems Britain’s friendship with Nepal, a country which has proved a staunch ally ever since and has become our ‘oldest ally’ in Asia. Never has the trust that was then placed in the Gurkha soldier ever been in doubt. ‘Keeping the Peace’ in India under the British flag began for Gurkha soldiers with the Pindaree War in 1817, and the first battle honour gained by Gurkha troops was at Bhurtpore in 1826. 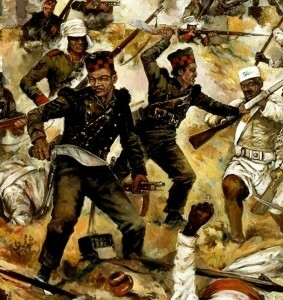 In the Indian Mutiny of 1857-1858 the 2nd Goorkhas showed striking proof of their loyalty at Delhi where, together with the 60th Rifles (now part of the Royal Green Jackets), they held Hindu Rao’s house, the key to the British position which was under continuous fire from the mutineers for over three months. During this period the 2nd Goorkhas suffered 327 casualties (including 8 of their 9 British Officers) out of a total strength of 490. Also during the mutiny, l2 Nepalese Army Regiments, a force of 8,000 men under the personal leadership of the Prime Minister of Nepal, took part in the final relief of Lucknow. 2nd Goorkhas in action during the Indian Mutiny. The loyal and gallant conduct of Gurkhas and their reliability during the Indian Mutiny, and particularly of the Sirmoor Battalion at Delhi , laid the foundations for their future. Their recognition gave them a greater place in the Army. New Gurkha regiments were raised during and after the Mutiny, and eventually there were to be ten rifle regiments each of two battalions all dressed in rifle green and with soldiers called Riflemen. The basis of all these privileges, style and affiliations which have lasted so long was the close comradeship of the 60th Rifles, The King’s Royal Rifle Corps, and the Sirmoor Battalion throughout the Siege of Delhi.